Twin Pack of Early Harvest - 1000ml each bottle. This extra virgin olive oil is produced entirely from green olives we harvest from our orchards in October. It is high in chlorophyll which explains its green color and grassy flavor. It is well balanced, robust but with an artichoke-grassy finish. Because green olives don't contain much olive oil, it is inevitably more expensive to produce. Perfect on mozzarella cheese, for bruschetta or fresh on seafood, it will certainly highlight any dish you prepare. This olive oil is available in limited quantity! From California's heartland come luscious green olives. From Italy's hearland com our love for olive oil and the art of extracting it. Enjoy this olive oil on your favorite dishes and experience the flavor of our bounitful land. The opalascnet appearance of this olive oil is a prescious trait due to minute harmless olive particles that will settle over time. An aspect of Bariani's California extra virgin olive oil is that it will differ in flavor and taste every year due to Bariani's traditional process of extraction. 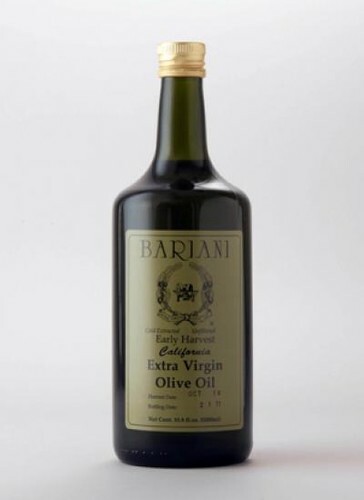 Bariani Olive Oil is committed in producing an authentic extra virgin olive oil which is raw and once only available thru the turn of the century. Produced in a limited quantity, the olive oil is a registered organic product and with the particular and discriminatory taste of the family, the quality is always guaranteed However, you will always find the same subtle characteristics that differentiate their olive oil from any other and that accommodate even the most discriminating palate. A great complement to any food and a perfect choice at any special occasion. Bariani's Olive Oil is Stone Crushed, Cold Pressed, Unfiltered California Extra Virgin Olive Oil. Keep in cool and dry away from direct sunlight. No additives or food coloring. A Cholesterol and Sodium free food.